New York's narrowest house -- No. 75-1/2 Bedford Street -- is on the market for the bargain price of $2.75 MM. 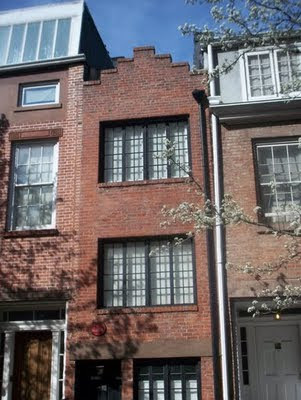 Edna St. Vincent Millay moved into the narrow house at 75-1/2 Bedford in 1924. It was Millay and her husband who remodeled the home, adding a skylight and the Dutch gabling on the front and back. The other famous tenant to live in the house is anthrpologist Margaret Mead. Mead was living there with her sister and brother-in-law, the cartoonist William Steig (best known today, perhaps, as the creator of Shrek). The New York Post has a feature on the house, including a photo essay that doesn't reveal much about the interior, but does have a picture of the unique four-in-a-row burner stove. Over at Curbed, you can download the floorplan as you mull over whether or not $2.75 MM is a good price for owning a conversation piece. God, I wish I had $2.75 MM for this house. I mean who wouldn't want to live in a piece of NY history? Sure it's narrow, but I'm just one person, I don't need that much space. Just a quick clarification if I may? Dave it is $2.75 Million dollars. A bargain really for Greenwich village.